Baker County Blog: What was Milo Pope Doing While AWOL from the August 24, 2010 Council Meeting? Just one item in this blog. It pertains to Councilor Milo Pope's whereabouts during Tuesday's Council Meeting, and the resulting ruckus when two citizens, myself and Jason Bland, investigated reports that he was holding yet another meeting, or "get together" with ex-City Manager Steve Brocato and his friends. Before I get too far along, I want to explain the obvious. I, as a sometime no-profit (actual loss) blogger and reporter, run into situations where I am reporting on events in which I am a participant with a fairly clear bias. I have not pretended otherwise to the best of my knowledge. One of the problems with mainstream journalism, in my view, is that they present themselves as beyond bias and very objective, which I feel is unrealistic, and which most viewers and readers can discern by reading mainstream reporting. I once wrote articles for a publication called the "Peace and Freedom Partisan" and was entirely comfortable with that because readers understood that we actually stood for something and took partisan positions. My humble blog is no different. I will not report on the activities of my brother, for instance, and expect you to think that what I write has no slant, or meets journalistic ethics in regard to emotional conflicts of interest. I write a blog, and it has a political position of sorts, while also trying to report news (that often carries a particular viewpoint, perspective, and sometimes, clear bias--but at least my intent is not to deceive you into thinking that I have a non-partisan position, like so many publications do. Just wanted to get that out of the way, as once again, I find myself reporting on public figures with whom I have expressed a clear difference of opinion on several occasions. In this blog, I am reporting an account of my experience, not the usual opinion piece, and not the least bit literary or even entertaining (although the latter is tempting). I just want my version of the events on the record, because I know that one or more papers will be reporting on it soon, with quotes from some of the other participants. My information is that one of the papers has a police report, which I do not posess, although if necessary, will obtain. I was given the opportunity to comment for a Record Courier article without knowing what other participants had said, and I chose instead to just report here what had happened. A response will be a forthcoming to any reporting by the papers that isn't in accordance with what I saw happen. I had intended, of course, to report on the event, but not necessarily in this manner. So . . . here is an account. 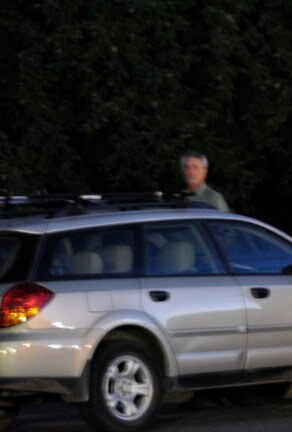 This last Tuesday night (8/24/10) I received a call sometime after 6 PM from an interested citizen who told me that Councilor Milo Pope was not attending the Council meeting, and instead was involved in his own get together with Steve Brocato, Jennifer Watkins, and Dave Davis at the law offices of Yervasi & Pope. He told me that a friend of mine, Jason Bland, was there to document Milo's whereabouts while an executive session and a regular Council meeting was occurring at the Council chambers that same evening at about the same time. 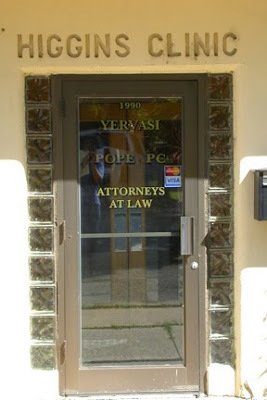 I had heard reports previously from this source about planning sessions taking place at the law offices of Yervasi & Pope at 1990 3rd. Street, across from the Court House, sometimes with Damien Yervasi in attendance, and normally with Milo Pope, Steve Brocato, and others. These meetings were alleged to have begun prior to the last Council election. It was also alleged that there was a well stocked bar in the building which supplied those present with copious amounts of alcohol during their meetings together. I have never attended such a meeting, but I believe the report, and those of others, to be credible, much like you trust someone who has not been shown to be untruthful in your dealings with them. The source had told me more than once that I should go down and see what I could find out about the participants of these meetings, and I wanted to do so. As it would be hard for me to document all that was mentioned above, please be clear that I am only reporting what I've been told by seemingly credible sources who have had the opportunity to know first hand. I was soon enough in contact with Jason Bland, and decided to go down and offer whatever assistance I could in documenting that Milo was there and with whom. The main reason I wanted to do so was that most people expect that Councilors will attend Council meetings when in town so as to faithfully fulfill their duties as Councilors. They surely don't expect them to be off meeting with fired City Managers who are currently suing the city, as Steve Brocato is. Milo has held another seemingly uncalled for meeting with fired City Manager Steve Brocato that was reported on in the Herald. As far as I know, performing the duties of Councilor to the best of one's ability does not include ditching a Council meeting so as to meet and party with a fired City Manager who has a lawsuit against the city, or with other ex-councilors and ex-city employees. So, given my interest in the issue, I rode down on my bicycle, cameras in basket, and tried to assist and witness what was happening. My biggest regret is that I didn't anticipate the aggressive response from the folks in the building and so didn't take my movie camera to document on video/audio what they did and said when we were about to leave. I only wanted a few photos to document that Milo Pope and and friends were there when he was supposed to be at a Council meeting. 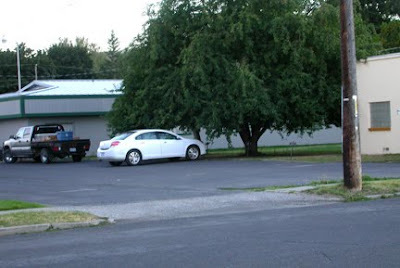 When I arrived, we positioned ourselves on public property so as to view who was leaving the building. 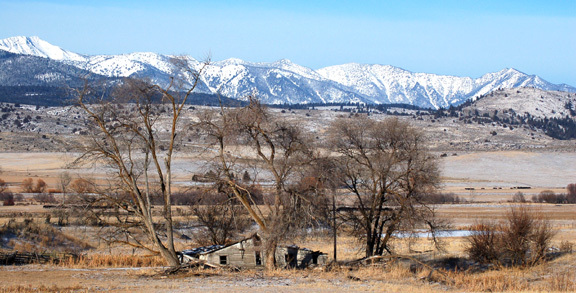 Here is some of what we saw when I was there. (Jason had showed me a photo of Dave Davis leaving before I arrived. I was obviously not there to witness that.) I have subsequently been informed that Andrew Bryan was not there earlier but that Jeff Petry was. 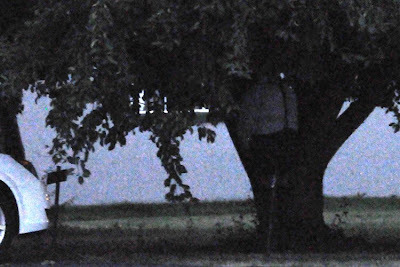 At about 7:04 PM, according to my camera, Milo Pope emerged from the building and walked over to the large tree by the parking lot and stood there with his hands down near the front of his pants for a minute or so. It had become dark rather rapidly in that shaded area, and not being used to taking photos with a long lens at night without a flash, I didn't have the shutter speed set appropriately, thus resulting in a poor grainy photo (Although they all would probably been a bit grainy.). Check photo above very carefully to the left of the tree in front of Councilor Pope, where the dark grass meets the building in the background for other subtle details. After taking a brief break by the tree, Councilor Pope went around the building and returned to the north east corner, where he checked his cell phone a few minutes later. (see photo below) He then returned to the get together in the building. - At 7:14 PM, Jennifer Watkins left the building and got into her Dodge Durango. At around 7:30 PM, Milo came out and stared at me while I was preparing to leave on my bike. At about the same time, Steve, Jennifer, and Andrew came out and looked over at me, seemingly amused. I grabbed the long lens out of the basket and took two fuzzy photos, hand-held, without a tripod or support. That's When Things Got A Bit Out Of Hand. Anyway, I believe that Milo and Andrew then tried to separate them by sort of pushing Steve back across the street, but the two continued their "communications" and Milo was apparently touching Jason again, so it seemed like the time to go across and help calm things down. 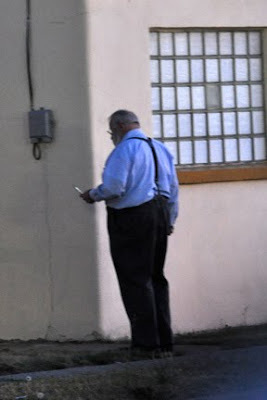 When I crossed the street, Steve Brocato, in his always counterintuitive and seemingly arrogant way, decided to call the Baker PD, to whom he had gifted a building a few years earlier, even though it was he who initiated the scuffle by getting in Jason's face and knocking off his hat. Vintage Brocato in my view. I was told by one participant that his speech was slurred when he made the call to pd, but I have not confirmed that. Two rather calm officers, Plaza and Downing, arrived shortly thereafter to help sort things out. Jason and I were interviewed first, and they ran a check on my name and license in the system. They then interviewed some, if not all, the other participants, but I don't know whether they ran their names and license numbers through the system. Jennifer called her husband who came and took her home, leaving the Dodge Durango parked at the curb. A little later, Becky Fitzgerald dropped by, saying hello, and that she was just passing by on her way home from the Council meeting. Jason and I spoke with the two officers about the situation, and Jason was told he could file a charge of harassment against Steve Brocato, but he declined to do so. I wondered if any of Steve Brocato's behavior would be documented in a police report and I believe I was told that it would not be unless Jason filed charges. Not sure where that stands. I was just recalling some of the other incidents of people being thrown out of his office, the incident with the child, the interactions with myself and others at previous Council meetings, and etc., and wondering if any of this apparent pattern is ever on the record. That's it--just about all the important details I can recall. Things happen when you catch someone apparently shirking their public responsibilities to meet with a friend and disgruntled former City Manager who is suing the City. As far as I know, performing the duties of Councilor to the best of one's ability doe not include ditching a Council meeting so as to meet and party with a fired City Manager who has a lawsuit against the city, and other ex-councilors or ex-city employees. Just corrected the typo and readability. Might be better, but anyway, thanks. This is an interesting story, and I'm glad I stuck with it. I have to be honest though, that was very difficult. Your lead is burried literally pages down while you spend paragraph after paragraph disqualifying yourself as a journalist. Do officers Plaza and Downing have first names? What was the nature of the stop they performed on you near the end of the story? So many questions unanswered, not for lack of information, just simple omission. Wild times in Baker City. 2) Tell me about your own expertise to analyze and criticize the form and content of blog articles. 3) I don't really know what a "lead" is, and I'm not sure I care, but can you be more specific? I don't consult a textbook, I just let it flow and try to use a relevant heading. I do attempt to make sense and tell the truth, and I think we could use more of that. You write that I "spend paragraph after paragraph disqualifying [myself] as a journalist." Are you speaking of the mythical unbiased and perfectly objective reporter without conflicts? I don't believe they exist and have never met one. I was trying to clarify my own conflicts as a reporter of the event and a less than perfect "journalist," and did so in two paragraphs. I was stopped by Officer Plaza a bit like a friend might stop me as I ride my bike down the street. He didn't turn on the overheads--not that sort of legal stop for some sort of infraction--just said something out the window as he passed and pulled over in front of me. I stopped behind him and he got out and came back and we chatted. He asked me about my cameras and we talked about his wanting to get one for someone and etc. Other things too, like people who are getting to know each other might talk about. Very pleasant encounter, and personally, a good interaction for me to have. That said, I have no way of knowing why he came to talk with me, instead of going elsewhere. Yes, omission. Hopefully not the important stuff. I usually am told I include too much detail. Here is something I omitted: The building is Dr. Higgins' old medical clinic, and like most medical clinics, has a private bathroom. Anyway, thanks for your comments, and I welcome suggestions/constructive criticism for improving the blog, even if I don't always agree, understand, or take them. Regarding the stop after I left, I should have made plain that the person was in a police patrol car, which obviously had some effect on the encounter/contact with officer Plaza. Thanks Lorelei! Email me at refugee2000@gmail.com.